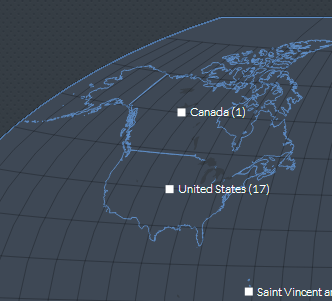 I'm working with topoJSON and D3 to display Natural Earth data on a globe. Obviously, we need to simplify our geometries while still keeping borders consistent. We've created a script as based on Mbostock's Map Tutorial. Here's the link to our gist. 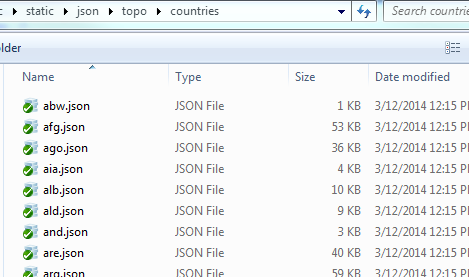 Once we run the script, it outputs all the countries as .json files. However, when we load the USA, we encounter a problem. When we mouse over the USA, the entire globe is highlighted. United States without mouse hover. Is there something in our script that would cause this? We need to simplify our geometries for performance purposes, and we need to preserve boarders. TopoJSON was the clear choice, but we could be calling it incorrectly. This looks like a symptom of a not topologically correct polygon. - Filling an open (last point and first point different)shape with svg and css may result in filling everything. - Filling a shape not respecting the RHR (Right Hand Rule, clockwise) will fill the outside of the shape. I would check that your source shape/geojson file is closed and RHR. Not the answer you're looking for? Browse other questions tagged shapefile d3 topojson natural-earth or ask your own question. Filtering a Topojson on server-side. Which part of topology I need? 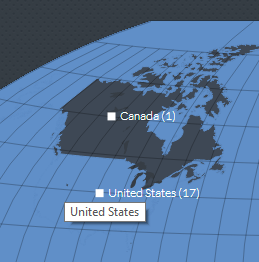 How convert a genuine UK shapefile(other than the one from natural earth) to d3/topojson? Is Natural Earth (the site) dying? Which D3 microlibraries are required to load TopoJSON/GeoJSON files and translate into path definitions? Criteria of Countries selection in Natural Earth Data 1:110m?